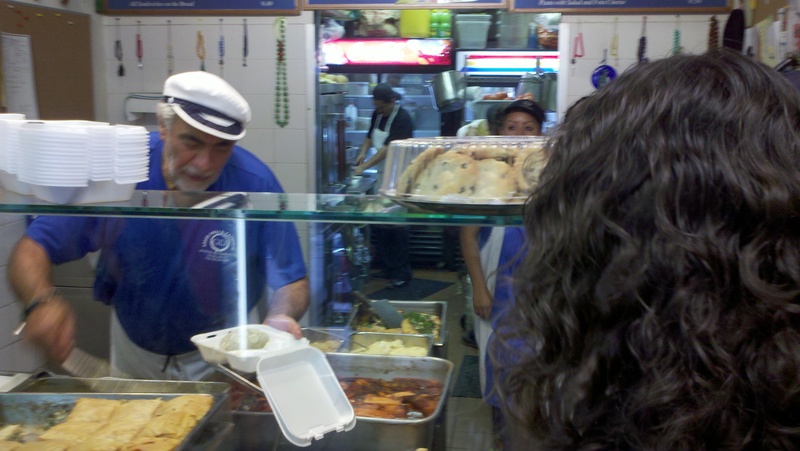 Greek Deli on 19th Street NW in DC is lunch spot where you can expect a line every day of the week. The line is indicative of just how amazing and authentic the greek cuisine offered there is. Kostas Fostieris is the Chef and Owner of this gem of an establishment. The man loves food and his customers and you can taste it in every bite in every dish you grab from there. The gyro, the sides, the meatballs- I’ve not come across a single item that wasn’t extremely satisfying. Last week I went on a little progressive eating outting with some co-workers. First stop was Pinkberry for the last free greek yogurt Wednesday of a month or so long promotion. I had a pretty decent turkey and avocado sandwich waiting for me at the office, but once co-workers suggested Greek Deli for lunch it wasn’t long before just walking with them to GD turned into just getting a side turned into getting the Wednesday meatball special (authentic greek meatballs with lemon and white wine sauce and a side of greek salad). As I stood in line, I began to snap a few photos with the intention of writing about GD. Next thing you know Kostas and his staff starting chanting about “Paparazzi!! 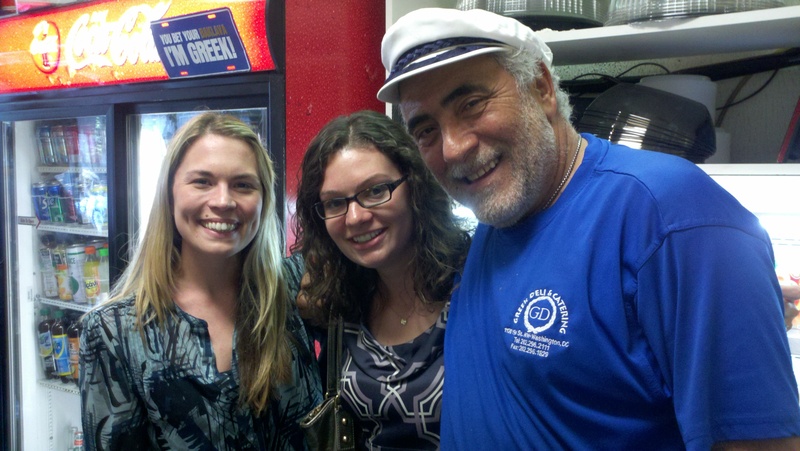 !” and Kostas was around the front of the counter asking to take photos with us. How fun! 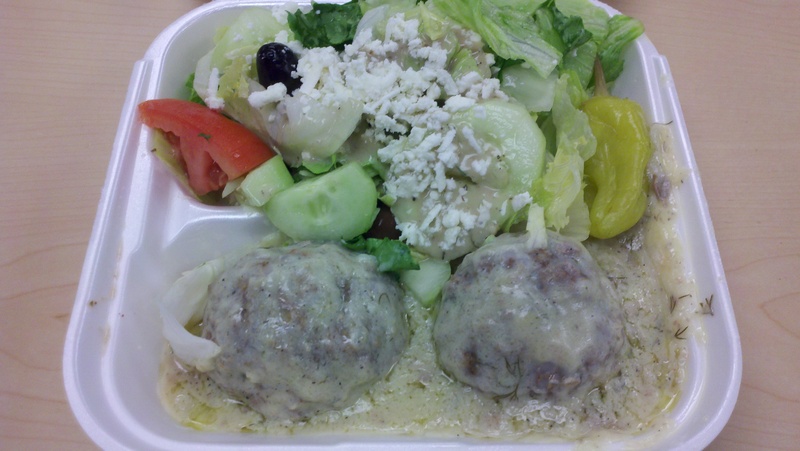 I am such a fan of our friendly neighborhood Greek lunch spot 🙂 If you work around the Farragut West area and have not had Greek Deli, you know what needs to happen for lunch one day this week. I told you Herndon Festival was around the corner. I actually decided with the amount of food festivals and “Taste of’s” Bryan and I hit every year that I will make a Food Festival category for the blog. It just makes sense! St. Katherine’s Greek Festival, a festival down the road from us with you guessed it- great Greek food and culture, was on the calendar for this weekend as well. We weren’t sure we’d make both as B had a golf tournament out of town, but we made a showing there too. More to come to that end another day. This was the third time we’d hit up Herndon Fest. The festival is free and includes live music, arts and crafts vendors and other business expo exhibitors, carnival rides, and of course, awesome eats. 🙂 It runs Thursday night through Sunday afternoon so go check it out if you want something to do tonight or tomorrow. Here is the website for more info: http://www.herndonfestival.net/. There is a great shuttle bus service that I recommend you look into if you end up going to the festival. In the past we’ve done the rides and taken in the other experiences, but this night was all about the food. Also, the vendors were not present on Thursday evening of the festival so we didn’t have the opportunity anyway. We arrived and did our typical walk through to get a lay of the land and plan out the menu. As a perfect starter, we had the $1.00 sample ($5.00 by the bowl) of Jimmy’s Old Town Tavern’s Jambalaya. Man oh man is it good! It has a fabulous kick to it. Good enough in fact that I suggest you hit up the Tavern to get it. They’ve been around like 15 years in downtown Herndon and follow the mantra, “Where everyone is treated like a regular.” You know you’ll feel real welcomed with that sort of mentality. We came back for another Jimmy’s Old Town Tavern food item after we inhaled John the Greeks’ Chicken Pita. John the Greek is a food concession business that is family owned and operated so you won’t find a standalone restaurant in Herndon, but I always grab a gyro, pita stick, or chicken pita when I visit the festival. You know how I said I’m tainted by meatballs now that I had filet mignon ones in Vegas? Well, I have a tainted by gyro issue in my life too. My college, James Madison University (GO DUKES! ), has a spot called Dave’s Downtown Taverna. It is home to the best gyro I’ve ever in my whole life. End of story. The tzatziki sauce is unparalleled. In any case, other gyros and chicken pitas work for me just not like Dave’s. If you are on I-81 S around the 240 exits and have a tummy rumble, get off at Exit 245 and hit up Dave’s Express on Port Republic Road or follow signs for downtown to sit down and enjoy the gyro at Dave’s Downtown Taverna. You will not be sorry! Back on track here…After the chicken pita, we re-visited Jimmy’s Old Town Taverna for the Festival Shrimp. This entailed 3 BBQ skewered shrimp wrapped in bacon. Oh myyyy gooodness. Bacon = always fantastic. It was the skewer of 3 decently-sized shrimp for $5 so of course we had to get our own! After those eats, we perused around for a treat. We had discovered one of the spots we looked forward to, The Tortilla Factory, had gone under after 37 years of business. The chicken nachos they offer every year are bomb.com so this was a total bummer. Thus, it was time to humor our sweet tooth. Nothing was jumping out so we decided to stay for the fireworks display and go venture elsewhere for a treat! B made a number of suggestions- none of which I was feeling so ultimately he put the ball in my court and tried very hard not to get super annoyed with me. Good patient guy! I suggested we head to a local 24 hour diner called Amphora’s. This spot holds a special place in my heart because my best friend from high school, Becca, and I used to frequent Amphora’s for late night hot tea and toast and maybe something else time to time. I’m aware how random tea and toast at 2 am sounds, but it was our thing! I made sure to tell Bryan how special he is for me to take him there haha. Amphora’s has a fantastic bakery with every pie, bread pudding, ice cream sundae, cookie, etc. you dream of. A table tent highlighting the pie of the month caught our eye. It was May 31st mind you and so the pie of the month was going to turn over the next day. After reading the description for the Chocolate Caramel Candy Bar Pie, we knew what was going down. As the picture in my slide show does not truly give this thing justice, please take a look at this picture and description!! B loves chocolate mousse and you have me at caramel let alone OOZING caramel. The addition of a scoop of vanilla ice cream was a great choice. Needless to say I was not planning on a bunch of treats the next day, but oops they happened at the Greek festival. I’ll tell you about it soon 😉 Have a fantastic rest of your weekend!